Colorado is a great place to do some modern dinosaur hunting because the state is loaded with dinosaur bones and sites where many of the major discoveries were made. The Denver area has a handful of spots where dinosaurs were first discovered, including one of the world’s preeminent dinosaur quarries. It also has museums with strong collections of dinosaur skeletons and casts and with plant fossils and other items from the age of the giant reptiles. Start the day by heading west of Denver to Dinosaur Ridge, which is on Colorado 470 about two miles south of Interstate 70. Take the Alameda Parkway exit. Dinosaur Ridge is the site of one of the nation’s earliest major dinosaur discoveries – the first bones of the Apatosaurus, a gigantic plant-eating dinosaur, found in 1877. Also found there for the first time were bones from the Stegosaurus, a smaller plant eater with armored plates running down its back and a spiked tail. The Stegosaurus is Colorado’s official State Fossil. Allow two hours to walk the 1.5-mile trail where you can see the dinosaur quarry from the 1870s, dinosaur bones still trapped in the sandstone rock, hundreds of dinosaur tracks and the Morrison Formation where dinosaurs were found. About three miles south of the ridge and just west of Colorado 470 is the Morrison Natural History Museum, which tells the story of the discoveries at Dinosaur Ridge through bones of the Stegosaurus and casts of bones from the Apatosaurus and other dinosaurs. The museum is small but specializes in teaching about paleontology and geology. Allow an hour. The museum is in the town of Morrison, namesake of the Morrison Formation where most of the dinosaur bones in the West are found. The layer of sandstone and mudstone was deposited by streams, lakes and rivers on coastal lowlands 150 million years ago. Exposed stretches of the Morrison Formation like those you see at Dinosaur Ridge have been the prime hunting grounds for dinosaur skeletons. If time permits, two other potential stops nearby are the Triceratops Trail in Golden to get a different look at dinosaur stomping grounds or to the Red Rocks Park and Amphitheater, which has no dinosaur connection but was formed by 300-foot-high red sandstone monoliths from the Morrison Formation. The Dinosaur Ridge Discovery Center opened in Red Rocks Park in 2014. After lunch, you will want to get onto Interstate 70 and head east to the Denver Museum of Nature & Science to learn more about dinosaurs. Take the Colorado Boulevard exit and head south to the museum, which is just north of Colfax Avenue. The trip will take a half hour. The museum has an excellent collection of dinosaur fossils. Be sure to see the 80-foot-long Diplodocus skeleton and Allosaurus and Stegosaurus skeletons doing battle. The museum has continued to conduct research, notably the discovery of the Theiophytalia in 2006. Plan on spending the afternoon at the museum, which also has exhibits on space, Egyptian mummies, gems and minerals, Native American cultures, wildlife and health, plus a hands-on Discovery Zone for kids. While you’re there, don’t miss one of the best views of the Denver skyline, with the often snow-capped mountains looming in the background, from the atrium on the fourth floor and the sky terrace above it. • Check out two other sites with key dinosaur discoveries in Lakewood and west Denver, though neither has been developed for visitors. About five miles east of Morrison is Carmody Park, where the first skeleton was discovered for the Ornithomimus, an ostrich-like dinosaur. About 10 miles to the northeast of Carmody is Denver’s Lakewood / Dry Gulch Park, where the first Triceratops was discovered. • Head 26 miles north to Boulder for the University of Colorado Museum of Natural History, which has an extensive collection of fossils, most of them plants from the Cretaceous period. • Cañon City: Garden Park six miles north of the city was a major spot for dinosaur discoveries, with bones excavated there leading scientists to describe and name such key species as the Allosaurus, Diplodocus, Camarasaurus, Ceratosaurus, Haplocanthosaurus and Epanterias. The quarries have been closed, but there are plaques about the key sites and a 1/4-mile interpretive trail. The Dinosaur Depot Museum, located in a former firehouse in Cañon City, has a replica of the world’s most complete Stegosaurus skeleton, taken from Garden Park, and cast skulls from other dinosaurs. • Colorado Springs area: The first Theiophytalia bone was discovered at the Garden of the Gods Park in 1886, but it took until 2008 to describe and name the new dinosaur. The park’s visitor center has a cast of the dinosaur’s skull. In Woodland Park, 30 miles northwest of Colorado Springs, the Rocky Mountain Dinosaur Resource Center features dinosaur fossils from the Cretaceous period. • La Junta: Picketwire Canyon south of La Junta has more than 1,300 dinosaur tracks preserved in a 1/4-mile stretch of stone, the largest set in North America. 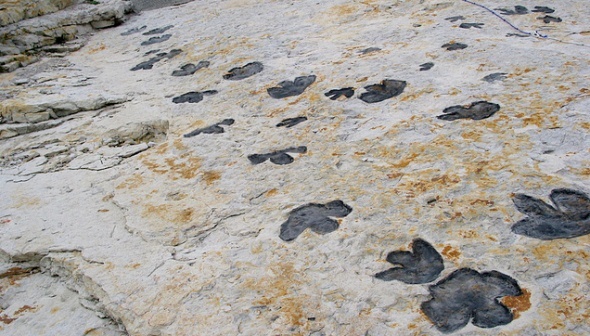 Dinosaurs passing through the area 150 million years ago pounded their tracks into the mud surrounding a lake that filled the Purgatoire Valley. Partial dinosaur skeletons also have been discovered. • Delta: The Delta County Historical Society Museum has a collection of dinosaur bones donated by rockhound Vivian Jones, who found the first bones of the Supersaurus and Torvosaurus from Dry Mesa in the early 1970s. About 4,000 bones from 17 different dinosaurs were excavated from Dry Mesa Quarry, but the site was closed in 2000. • Dinosaur National Monument: More than 1,500 dinosaur fossils set in a wall of sandstone are featured in the new Quarry Exhibit Hall at the Dinosaur National Monument. The hall protects the site where paleontologists excavated thousands of dinosaur bones before the monument was created in 1915.